THE APOSTLES FAST CONTINUES THIS WEEK! MON. JUNE 19 The Holy Apostle Jude, Brother of the Lord. Patara. Our Holy Father Nicholas Cabasilas. WED. JUNE 21 The Holy Martyr Julian of Tarsus. of the Holy Icon of the Theotokos of Vladimir. SUN. 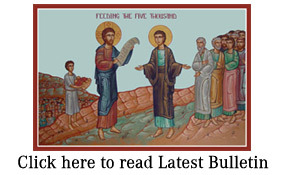 JUNE 25 THIRD SUNDAY AFTER PENTECOST. Post-Festive Day of the Birth of St. John the Baptist. The Holy Venerable Martyr Febronia.